It has been awhile since my last post. Can't be helped really. Sometimes I get really busy! Anyway, I spent a few days at KAF (Kandahar Airfield) getting some paperwork done. I am taking on some extra duties on top of my primary job and those duties required that I take a class and get an LOI (Letter of Instruction). I am now a FOO! What is a FOO you ask? A FOO is a Field Ordering Officer. I am partnered with a Pay Agent and together we get to spend money. Of course there are all sorts of things I can't buy but if you need $2500 worth of gravel, I am your man! Another thing we did at KAF is restock our little PX. I was put on the purchasing list so when the soldiers that run the PX go on leave, I will run the PX and keep it stocked. We met the manager, we went into the stock room, grabbed a clip board, and went shopping. I never bought $2000 worth of chips before. Our DFAC prepares decent meals but sometimes Joe just wants some chips and dip. As soon as we loaded our PX purchases in the conex (container) and arranged for it to be trucked to our PRT, we got the first bird back to Tarin Kowt. It was a Chinook and let me tell you, it was a better ride going back. We flew on a C-130 to KAF and we were NOE (Nap of the Earth) all the way. A third of the passengers lost their lunches. The man next to me, a chaplain, almost made it to KAF but he lost it on our final approach. You normally sit facing the center but I was getting woozy. Fortunately, I had a portal next to me so I twisted aroung to look outside. It was a helluva ride. When me and my colleagues got back we went right back into our routines of missions and staff work. The ANA soldiers are doing really well with their training. I have been going on missions with the ANA and Civil Affairs folks and doing the write-ups (doing that Public Affairs thing). In a couple of days it will be Thanksgiving. The cooks are promising a really big feed. The Army never really takes a break so we will still be doing work but the meal will be a nice event. Some of the soldiers here are learning to play the guitar and they are going to provide entertainment. It promises to be a good time. So, what do have to be thankful for seeing as how I am spending it in indian country (an old army term from the days of horse cavalry). I am thankful that my wife was crazy enough to marry me. I am thankful that she has borne us two wonderful sons. I am thankful for all the people back home that are watching out for my family while I am here. I am thankful that my parents emmigrated from the Peoples Republic of Canada and made a go of it in the United States. I am thankful that as long as I maintain a good attitude I can get a job, it may not be the one I want, but a job nonetheless. I am thankful that we have a political system that allows for civilized debate. I am thankful that Missouri trusts me to defend my family and friends with a concealable firearm. I am thankful that the test for citizenship in the US focused on the Constitution, the Founders, and the idea of what makes us uniquely American. 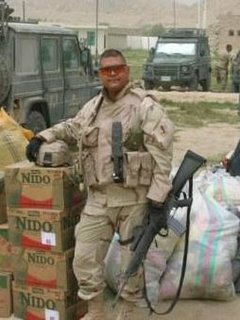 Having been to the Phillipines, Canada, Mexico, Panama, Germany, Belgium, Bulgaria, Serbia (Kosovo), and Afghanistan, I thank God every day that I am an American.